Georgia native and Southern impressionism artist David Boyd Jr. will visit Darlington School on Dec. 13-14, 2018 to work with visual arts students and provide a hands-on art experience, share tips and techniques, answer questions, and give a real-world perspective on his creative approach to art. An open art exhibit and reception at Darlington’s McCallie-Kennedy Library will be a highlight of this visit from Boyd. The exhibit will be open to the public on Dec. 13 from 4-8 p.m. and a reception with the artist will be held from 6-8 p.m. with paintings available for purchase. Boyd’s roots are in Georgia, but he also a Darlington connection in Jenna Black, art teacher for grades 2-8. "I'm so proud to know David Boyd Jr.,” said Black. “We are lifelong friends who grew up together in Newnan, Ga. David has always had a gift for art. 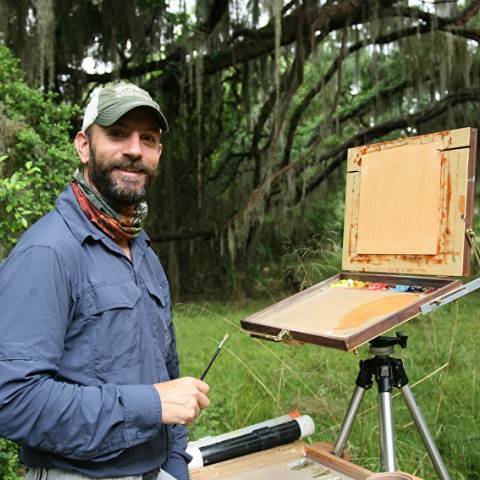 He is a graduate of the Savannah College of Art and Design, taught art at The Heritage School, and is currently a full time artist who has won many accolades and awards. He is not just a fabulous artist, but also a wonderful person, husband and father. You will love him! I am so happy that the Darlington Community will have this opportunity to learn about David and his work." Boyd considers himself an obsessed experimenter and recently has been focusing on studio and plein air oil paintings of the urban and rural landscape. During the school day on Dec. 13 and 14 students in grades 6-12 will have the opportunity to work with Boyd and learn more about his unique approach to painting. Boyd’s work can be seen at Two Smith's Gallery in Duluth, Ga., Fine Lines Gallery in Newnan, Ga., Cecil Byrne Gallery in Charleston, SC, Two Galleries in North Atlantic Beach, NC and Quincy Avenue Art and Things in Seaside, Fla. Boyd’s work can also be seen at The Boyd Gallery in Newnan, Ga. by appointment. View Boyd’s work at www.davidboydjr.com.